The Planar® EP Series is a line of Ultra HD resolution (3840x2160) professional LCD displays that offer best-in-class reliability with stunning image quality. Available in 50", 58" and 65", the displays come standard with commercial-grade features required for digital signage, corporate and control room environments. Also available in touch versions, Planar EP Series displays bring interactivity to the 4K immersive experience. With four times the resolution of Full HD, Planar EP Series displays deliver life-like picture quality and an immersive experience. 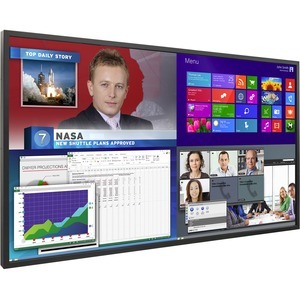 Compatible both existing Full HD and 4K sources, the displays support both current and future use. With Planar EP Series displays, Full HD or sub-1080 content can be up-scaled to fill the entire 4K display area. Planar EP Series displays combine the visual benefits of 4K resolution with the commercial reliability required by demanding 24x7 commercial operations. Ideal for public spaces, an all-metal casing offers added durability and heat dissipation. Featuring built-in processing that supports simultaneous viewing of 2, 3, or 4 sources at one time, Planar EP Series displays leverage commonly used layouts that can be saved and conveniently recalled upon command. The Planar EP Series supports native 4K resolution at up to 60Hz, enabling smooth video and mouse tracking. True 4K at 60Hz can be driven via both DisplayPort 1.2 and HDMI. All Planar EP Series displays come standard with expansion slots that support Intel's Open Pluggable Specification (OPS), making them compatible with OPS devices such as media players and PCs. With Planar EP Series displays, visual content can also be complemented with audio messaging using built-in speakers.